Happy Valentine's Day Math and Literacy Party! First Grade includes a 12-panel reading mini-book for students, and the math includes coloring/sorting/graphing hearts, counting by 2's to 100, one less-one more, and ten less-ten more. 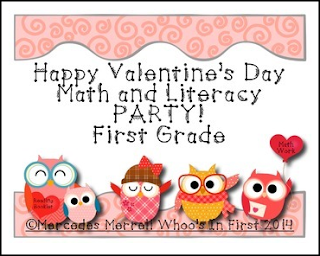 These can be used during math and literacy centers for Valentine's Day fun! I created this product as a way to show my first 100 fans how much I appreciate them and the support they have given me!! Enjoy!